Looking for a vacation on a small, personal resort with integrity? Want to wake up in crisp fresh linen with the ocean right outside with no other major decisions to make other than if you shall enjoy your fresh coffee before or after the morning beach walk? There are in total 20 Bungalows in our resort. 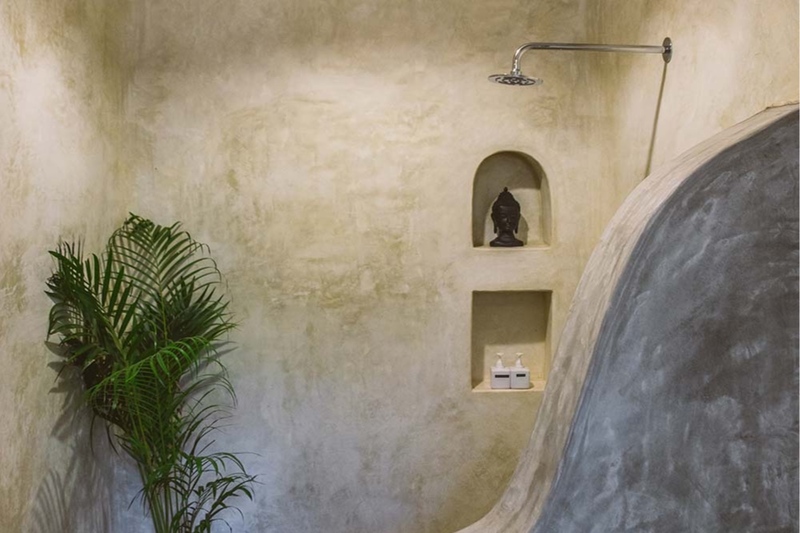 It is divided in two areas, both right on the beach just 150 meters apart, both having their own receptions; Palm Grove, where our restaurant is located and Little Palm Grove, where the Yoga Shala is located. We have put a lot of love and good energy in our Bungalows to make you feel comfortable. The materials we use is soft concrete, bamboo and grass roofs. Using colours that will make your eyes rest. We have AC in 13 of the Bungalows located at Palm Grove and cealing fan in the White House and the 6 others located at Little Palm Grove. The Bungalows have one bedroom with a kingsize bed. There is a modern attached bathroom to the room. 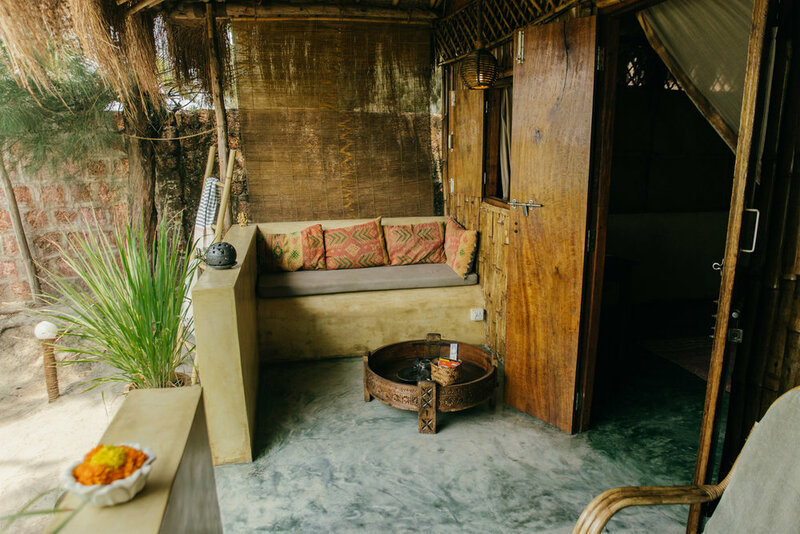 You enter the Bungalow through the veranda, perfect for that sunset reflection of yours. No matter in what Bungalow you stay when you are with us - you are never more than 50 meters away from the beach! Rosie Slow. Facing the amazing Arabian Sea. With a view that will take your breath away. Love n' Light, Wild n' Crazy, Sunlight, Honey Bunny. With glimpses of the ocean between the leafs of our garden. Cookie Cool, Go Slow, Happy Hippie, Moonlight, Slow King, Hair Om, Monsoon, Delhi Diva. With views towards the garden mixed of Bouganvilla, Bananatrees, Lemongrass and more. Sunny & Plenty, Morning Glory, Star Dust. Fronting the amazing Arabian Sea. With a view that will take your breath away. Sunseeker, Rise & Shine, Boho Glow. With glimpses of the ocean between the leafs of our garden. The White House has two bedrooms. Perfect for a family. One bedroom has one king-size bed and the other bedroom has 3 single beds. The rooms share bathrooms and a big veranda.